We’d love your help. Let us know what’s wrong with this preview of The Killer's Cousin by Nancy Werlin. When seventeen-year-old David Yaffe moves into the third floor of his aunt and uncle's Cambridge, Massachusetts, triple-decker, he already has a lot going against him, but the antagonism his relatives display increases his troubles.Recently acquitted of the murder of his girlfriend in a nationally publicized trial, David struggles to come to terms with the way that the eve When seventeen-year-old David Yaffe moves into the third floor of his aunt and uncle's Cambridge, Massachusetts, triple-decker, he already has a lot going against him, but the antagonism his relatives display increases his troubles.Recently acquitted of the murder of his girlfriend in a nationally publicized trial, David struggles to come to terms with the way that the events of the past year have changed his life. His eleven-year-old cousin, Lily, exhibits malicious behavior that escalates from eavesdropping and taunting to "guerrilla attacks" on David's apartment-strewing trash, destroying computer files, gluing CDs into their cases. Consumed by problems in their marriage dating back to the death of their older daughter Kathy four years before, Lily's parents refuse to recognize her disturbing actions and attitude. To ask other readers questions about The Killer's Cousin, please sign up. how does kathy die? and who killed her ? okay, this book is not four-stars like proust is four-stars. this earns its rating because after reading a series of "ho-hum" and "meh-meh" teen books - this one was actually pretty good. except for the epilogue, which made me a little embarrassed. ungood. it's kind of a ghost story, it's kind of a mystery, it's kind of a story about a creepy little kid, it's kind of a coming-of-age story. it may be just that i read it in about an hour and a half, so my reading didn't get interrupted, but it felt very fast-paced and exciting, and the story itself was well-told and original. and it won an edgar award. it's weird, i liked it a lot while i was reading it, but today, the day after, i can't remember why. 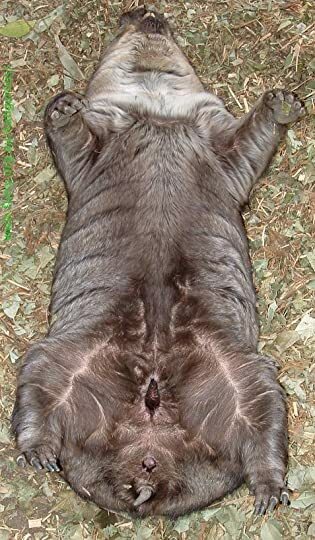 here is a picture of a wombat tummy instead! I love Nancy Werlin. Her ability to write different genres always amazes me. The Rules of Survival severed my heartstrings, Double Helix was a decent science-fiction novel, and Killer's Cousin was thrilling and suspenseful. Seventeen-year-old David Yaffe feels guilty for the death of his girlfriend, Emily - despite the jury acquitting him and proving his innocence. He decides to move in with his aunt and uncle in Massachusetts, where he resides in their attic apartment. Strange things are lurking I love Nancy Werlin. Her ability to write different genres always amazes me. The Rules of Survival severed my heartstrings, Double Helix was a decent science-fiction novel, and Killer's Cousin was thrilling and suspenseful. Seventeen-year-old David Yaffe feels guilty for the death of his girlfriend, Emily - despite the jury acquitting him and proving his innocence. He decides to move in with his aunt and uncle in Massachusetts, where he resides in their attic apartment. Strange things are lurking in the shadows, though. His aunt Julia remains cold and disdainful, and his eleven-year-old cousin Lily proves to be a psychotic freak. Especially Lily, who there seems to be a lot more to than meets the eye. The sole factor that earned this book three stars was the suspense. It was frightening, and the psychological drama had my head reeling from beginning to end. In fact, I would recommend this only to people who enjoy thrillers or suspense centered books. Most of the characters irked me, however. I came close to empathizing with David, but only managed to sympathize with him and his guilt. Lily scared the heck out of me, and all of the adults in this novel were irritatingly unaware of the situation unfolding. David's friend Frank and his casual love interest Raina seemed more like plot devices than three-dimensional characters. Nancy Werlin picks another interesting topic to address in her book. This novel is a killer's story, a story of a teenager who was acquitted of his girl-friend's murder and now has to attempt to start fresh in a new town, among new people. Once he moves in with his aunt, uncle, and cousin, he is forced not only to relive his guilt, shame and regret, but theirs as well, because they have their own tragedies to face. 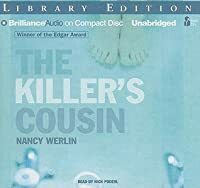 "The Killer's Cousin" is a skillfully done thriller which in spite of its predict Nancy Werlin picks another interesting topic to address in her book. "The Killer's Cousin" is a skillfully done thriller which in spite of its predictability, still manages to keep you in suspense and even terror. David's "voice" is believable, his emotional torments are sincere. There is no real happy ending to this story, as there is no real way to atone for a murder in real life, but that only adds to the believability of this notable novel. After reading The Rules of Survivaland Impossible, I have become quite a fan of Nancy Werlin, and I found The Killer's Cousin to be another interesting book from this author. The main character's struggle with his past and his strange and difficult present lead to an interesting story with strong character development. Although some readers will predict part of the ending, the final scenes do offer some surprises and a satisfying and hopeful conclusion to a fairly sad story. Well this is one of those mood whiplash books. And it does it perfectly. (view spoiler)[ Lily, the titular killer's cousin, is the nastiest little witch ever. And not in the "I'm so much better than you mean little girl" sort of way, but in the literally terrifying "what is she going to do next?" sort of way. She's clever, scheming, and downright evil at times towards David, the main character who was just acquitted for murder of his girlfriend (I think it ended up being a manslaughter case, it Well this is one of those mood whiplash books. And it does it perfectly. (view spoiler)[ Lily, the titular killer's cousin, is the nastiest little witch ever. And not in the "I'm so much better than you mean little girl" sort of way, but in the literally terrifying "what is she going to do next?" sort of way. She's clever, scheming, and downright evil at times towards David, the main character who was just acquitted for murder of his girlfriend (I think it ended up being a manslaughter case, it was never made clear), and just moved in with his Aunt Julia and Uncle Vic. Vic apparently let David stay because "he knows how it feels" or something... it has to do with their eldest daughters (view spoiler)["suicide" (hide spoiler)] though I'm not sure how this would cause him to sympathize with David. Anyway, the Aunt Julia, who has never really liked David or his mother, is cold toward him, and Lily, as mentioned before, is incredibly hostile. It's rare that any character can actually keep me on edge without me knowing anything about them, but seriously, this girl is messed up. On top of that, David is (view spoiler)[literally (hide spoiler)] haunted by Kathy's (his other cousin) ghost telling him to "helplily helplily helplily". Every time Lily came up in the narrative, I was on edge. She acted like she literally wanted to kill David. Her first uttered sentence to him was “did it feel powerful when she went down?” And from then on it gets worse and worse. Her parents have a strained relationship because of Kathy’s death, and they use Lily as a go-between like “Lily, ask your father if he would like seconds” (they’re just across each other at the table). A few things David says and does sort of repairs some of the strain of their relationship, and though he has repaired her parents’ feud, Lily is outraged. David is often uncomfortable, and because this is narrated first person by him, there are many long stretches of awkward silence and tension. Werlin did an excellent job of making me feel exactly what the main character was feeling. The disgust for his aunt and uncle for not listening to his concern for Lily’s mental health, the anxiety of starting a new school after his face had been tabloid headlines for the past few months… the unsettling atmosphere every time Lily showed up. In the end, we realize with David that (view spoiler)[ “guilt attracts guilt”, and that Lily actually killed Kathy… it was never a suicide. Lily may be a terrible character throughout the book, but it was made infinitely worse knowing exactly how and why she killed her sister (when she was seven, nonetheless). Shortly after confronting Lily, David he tells her that she won; she has succeeded in making him leave, and he moves out. Shortly after that, however, he sees Kathy’s ghost again, “helplily helplily helplily”, and he eventually runs back to the house just in time to see it on fire. Lily is nowhere to be found, and he knows exactly where Lily would be. He charges into the burning house and rescues her from not only the fire, but herself. Lily has felt immense guilt at her sister’s death (big shock), and because she was only seven when it happened, no one actually believes that she killed her. They think that it was a hallucination of the stress of “being there when her sister ‘committed suicide’”. Lily was trying to die in the same way Kathy died, and she struggles for a while to keep David from saving her, but David tells her that her punishment is not to die, but to learn to live, like him. From then Lily hangs on to him, he charges though the house and passes out. David learns later that they had to sedate Lily in order to get her away from him. Thus, the mood whiplash. Lily is an evil demon. Lily is even worse because she’s a hypocritical murderer. Lily is just confused and not getting the help she needs, and genuinely feels remorse for what she has done (and, like David, it was an accident). All the disgust aimed at her immediately goes to Aunt Julia and Uncle Vic, who have made it their policy to never talk about Kathy, never be real parents to Lily. They are caught up in their own selfish little world of pretending that everything is always fine yet being incredibly hypocritical and mean towards people who they blame for everything wrong in their lives. David is almost finished with high school, but, he cannot complete his education in the area where he lives with his parents. Previously on trial for the murder of his girlfriend, he was found not guilty. Because of all the constant media attention, his parents make a decision to send him to live with relatives in Cambridge, MA. While trying to sort through his life and consequences, it becomes increasingly difficult to navigate both his past, and the new home where, in particular, his Aunt, rea David is almost finished with high school, but, he cannot complete his education in the area where he lives with his parents. Previously on trial for the murder of his girlfriend, he was found not guilty. Because of all the constant media attention, his parents make a decision to send him to live with relatives in Cambridge, MA. While trying to sort through his life and consequences, it becomes increasingly difficult to navigate both his past, and the new home where, in particular, his Aunt, really does not want him in their house. This family also has a lot of garbage to sort through while also suffering from a great deal of grief because of a death/suicide of a teenage daughter. The new family includes an Aunt who truly does not want him, a nasty, manipulative sociopath, child, and an Uncle who tries to deal with his own family dysfunction and grief while trying to make David comfortable in their home. This has sat on my shelves for some years now and I’m not even sure where it came from. I have a vague recollection of picking up free with a selection of other books being given away. I fancied something brief and this fit the bill. It’s a very quick read, partly the length, partly the writing. The set up is initially intriguing, the supporting cast are nicely portrayed and some of the relationships are satisfyingly complex. I just couldn’t get on with the voice of David - it all felt a little o This has sat on my shelves for some years now and I’m not even sure where it came from. I have a vague recollection of picking up free with a selection of other books being given away. I fancied something brief and this fit the bill. It’s a very quick read, partly the length, partly the writing. The set up is initially intriguing, the supporting cast are nicely portrayed and some of the relationships are satisfyingly complex. I just couldn’t get on with the voice of David - it all felt a little overwrought and melodramatic. That’s probably harsh given it’s about a young adult who is struggling to move on from accidentally killing someone. But there you have it. The tension builds but the central conceit was fairly obvious and the ending just fizzled (even if it gamely tried to provide an answer for how you move on following something so devastating), while the ‘haunting’ aspects never really worked. Also, is store card swapping actually a thing? Not bad by any means, just not really for me. An interesting story about overcoming grief from a loss. I have discovered that physcological thrillers are just not my type. Hence the one star rating, but I have a few other reason for that rating as well, which I shall attempt to briefly explain. I should probably start off with my reason for reading this book in the first place. Fact is, I was interested in the author's works, and so being the bookaholic that I am, I checked out all of the titles my library had by that author. And so this being the least interesting looking of them all, I decided t I have discovered that physcological thrillers are just not my type. Hence the one star rating, but I have a few other reason for that rating as well, which I shall attempt to briefly explain. I should probably start off with my reason for reading this book in the first place. Fact is, I was interested in the author's works, and so being the bookaholic that I am, I checked out all of the titles my library had by that author. And so this being the least interesting looking of them all, I decided to read this one first. And it turned out, it was a good choice too. First off, I do not agree with teens being allowed to do whatever they want. I know that sounds strange and first reading this you may think that I am an older person with a vendetta against freedom. Nope, I'm a teen myself with strong ideas of being allowed freedom as well. But the whole idea that teens are allowed to do whatever they want before eighteen, yeahhhh I never like that. Or on the flipside, the teens sneaking whatever they do behind their parents backs. This book had a little of both. While I'm not going to be like "bammo, that's wrong I'm going to burn this book" or some crazy thing like that, I am going to state my opinion. Which I already did, so I guess I can move on now. David Yaffe is seventeen years old and trying to rebuild his life after being acquitted of murder. David’s parents arranged for him to stay with his Uncle Vic, Aunt Julia and cousin, Lily while he finished high school. He struggles to learn how to live with the truth of knowing that he killed someone he loved. Although the death was an accident, simply knowing that he was capable of murder consumed him. At eleven years old, Lily has also experienced the death of a loved one, her sister Kathy. Kathy‘s ghost haunts David, desperately coaxing him to help Lily out of her rage and hatred; however, he wants no part of Lily’s life. Lily confessed to David that she killed her own sister; he wants noting to do with Lily. Through a turn of events, Lily and David are thrown together into a relationship that will help both of them learn to handle their own secret past. David and Lily share secrets and tremendous guilt in Nancy Werlin’s award winning work. David’s move helps him to finish school without brutal publicity of his crime. His apartment is eerie and dark; haunting. Lily incessantly questions David about his actions and the murder he committed, making him uncomfortable and angry. Both will learn that trying to forget such horrible secrets will hurt more than help. Secret gloom and a gothic style feeling make this mystery capture the reader until the last page! David was a high school senior who, acquitted of his girlfriend’s death, decided to finish high school in a different town. He moved in with Uncle Vic, Aunt Julia and little cousin Lily. The family was in turmoil because Kathy, Lily’s older sister had died. David tried to express his psychological concerns about Lily to his Aunt and Uncle but they did not agree. They accused David of being crazy and kicked him out of their house. From the time David arrived in Cambridge, he began to see shadows and hear humming which progressed to seeing his dead cousin Kathy saying “Help Lily”. Unable to sleep because of this apparition, David went for a run and ended up at his Uncles house burning down. David saved Lily from the burning house and helped her cope with life. In the end, Lily was the one who set the fire as a punishment for herself for killing her sister Kathy. This story is told from David’s point of view which explains the periodic flashbacks to Emily. He is struggling to find himself and live with what he has done. After being acquitted of killing his girlfriend, David moves to Boston for a fresh start. From the moment he arrives at his passive uncle's house he feels unwelcome by his angry aunt and creepy eleven-year-old cousin Lily. David soon learns that his older cousin committed suicide in the bathroom of his attic room, meanwhile Lily's obvious hatred for David continues to grow. I read KILLER'S COUSIN in one sitting which means it was good enough to hold my interest, but not good enough to make me want to stretch out the joy of reading the book. Despite a lot of passive verbs and telling rather than showing, I liked David's voice in his narration. I got a real feel for his discomfort and remorse, but wished he was less closed off. I felt that he could have been more fully fleshed out. The other characters were basically flat, though Lily's complexity became more dimensional in the last parts of the book. Although this book was first published in 1998, it doesn't feel dated. The Killer’s Cousin is actually quite a surprising story. From the title I had an image of gore and creepy killers but I was quite wrong. David has to repeat his last year of high school living with his aunt, uncle, and younger cousin Lily because of what happened last year. He lives in the attic where his older cousin (who mysteriously died) used to live, suffers through Lily’s awful tricks, and begins to unbury the secrets that have embedded themselves into the core of the family. The beginning had me asking all kinds of questions about what is going on and why these things were happening. Then, as the story unfolded, old questions were answered and new one’s emerged. Listening to the Playaway version helped me to “read” the book at a faster pace and not have to concentrate on the words individually but instead the story as a whole. I would definitely recommend the book to anyone interested in a mystery with many twists along the way! This is more of a 4.5 star book than a 5 star read. Who knows, as time goes on, I may even bump it up to a five star book. Werlin crafts and intense psychological thriller in The Killer's Cousin. The novel is narrated by David Yaffe, a young man who is acquitted of killing his girlfriend. When I started the novel, I didn't want to like him. I didn't want to believe. However, as the novel unfolds, I found myself feeling sympathy for David and the emotional aftermath of his girlfriend's death and t This is more of a 4.5 star book than a 5 star read. Who knows, as time goes on, I may even bump it up to a five star book. A tight, intense psychological thriller involving family secrets, family dysfunction, murder, and redemption. The title can refer to at least three characters in the book, and their lives intersect and intertwine. First person narrative keeps the tension going, as does the slow reveal of what really happened. Everyone except the artist renter is going through PTSD, and how they manage it is part of the story. The characters are complex and readers can have some good discussions about motive, trut A tight, intense psychological thriller involving family secrets, family dysfunction, murder, and redemption. The title can refer to at least three characters in the book, and their lives intersect and intertwine. First person narrative keeps the tension going, as does the slow reveal of what really happened. Everyone except the artist renter is going through PTSD, and how they manage it is part of the story. Creepy and atmospheric and always suspenseful, this is the story of a young man who has been acquitted of murdering his girlfriend--but who needs to get out of his hometown for obvious reasons. He goes to live with his aunt, uncle, and cousin in Boston. Turns out his cousin Lily is the creepiest sixth grader ever. Outstanding choice for book clubs for teenagers--a compelling read which has a LOT to talk about. I would not use with students younger than eighth grade due to implications about sexua Creepy and atmospheric and always suspenseful, this is the story of a young man who has been acquitted of murdering his girlfriend--but who needs to get out of his hometown for obvious reasons. He goes to live with his aunt, uncle, and cousin in Boston. Turns out his cousin Lily is the creepiest sixth grader ever. I can't say that I hate this book but I don't like it. It's a well written story and has great mystery to it. however it just isn't something I really enjoyed. The whole book was depressing and I predicted what happened long before it tells the reader. Lily, the little girl is creepy and a brat and David the protagonist is too much of a push over and the way he reacts to Lily doesn't seem realistic. Content: some language, violence, disturbing behavior from the child. Recommends it for: Everyone over fourth grade. It's a really good book about lilly ( The eleven year old girl.) and David (The guy who accidently killed his girlfriend.) David finds out a whole lot about lilly in the story with a great ending! I thought it wasn't going to be the best of book but it turned out to be really good. It's not for someone in grade school unless there parents are so positive that it should be fine. This is one of those thrillers where you know something awful happened, but you don't find out exactly what until the end. Underlying that is the issue of how people deal with guilt, and how a death can tear a family apart. A solid, suspenseful mystery for teens ages 13 and up. Review to come. I liked this a LOT. Fascinating and creepy. I can't believe I missed out on this one when it came out. For when this book was published this was a pretty good story. Now of course every book or story has some flaws but overall I felt that it was wrote pretty well and flowed nicely, not those dry spots where you are like please can we just remove these chapters. We have David being sent off to live with his mom's brother and family. Now the thing is David has been aquitted and now needs to finish high school however he had a cousin his age that died that would be Kathy and there is eleven year old For when this book was published this was a pretty good story. Now of course every book or story has some flaws but overall I felt that it was wrote pretty well and flowed nicely, not those dry spots where you are like please can we just remove these chapters. This book is about a teeage boy who has come to live with his aunt and uncle to redo his senior year of high school at a different school. He was aquitted of killing his girlfriend and now he has come to live in the attic of the house his cousin died in a few years back. On top of that his other cousin, Lily, is beyond mysterious. To say the least his experience is not a normal one. I enjoyed this book, but didn't get that feeling where I couldn't put the book down. It wasn't the most exciting my This book is about a teeage boy who has come to live with his aunt and uncle to redo his senior year of high school at a different school. He was aquitted of killing his girlfriend and now he has come to live in the attic of the house his cousin died in a few years back. On top of that his other cousin, Lily, is beyond mysterious. To say the least his experience is not a normal one. NOT my type of story. 1998 but didn't feel nearly as dated as I expected it to. Today's electronics were not there but it wasn't obvious. David accidentally kills his girlfriend when her brother is high on drugs. He is acquitted but moves to a new town with his aunt/uncle/cousin for a fresh start. Things are strange with the younger cousin from the beginning. She's creepy. In the end, we find that the younger cousin killed her older sister by giving her a glass of chemical cleaner (?) to drink. After the younger cousin sets the house on fire, the two bond over their shared experience of having killed someone. Hmmmm. Just not my thing. I went into this figuring it would be a pretty standard "creepy child" psychological thriller, and it did seem like that's the direction it was going for a good chunk of it, but I was pleasantly surprised by the depth and thoughtfulness of the ending. Definitely worth a read. Nancy Werlin writes young adult fiction: New York Times–bestselling fantasy, Edgar-award winning suspense, and National Book Award-honored realistic novels. Nancy's newest book is the suspense thriller AND THEN THERE WERE FOUR.